Teton Mountain Bike Tours will be offering Winter Bike Rentals. We have Kona Mountain Bikes with Studded Snow Tires plus Helmets for rent on a daily or multi day basis. 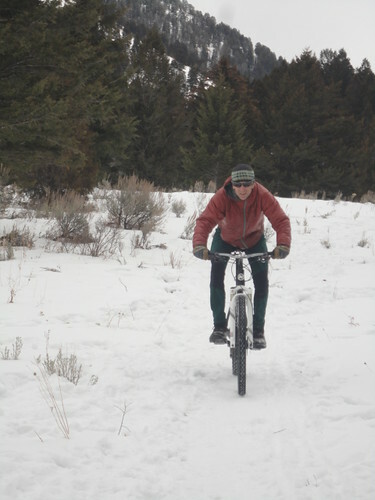 There are several Winter Bike Rides in the Jackson Hole area from the Teton County Pathways to the National Elk Refuge Road to Cache Creek Trails – check with TMBT for more details on these winter bike rides. Yes we even have some fun Winter Singletrack Rides close to the Town of Jackson. So for a Fun & Exciting Winter Activity – get a Winter Bike Rentals from TMBT and Enjoy a Winter Bike Ride in the Jackson Hole area. Call us @ 800-733-0788 or 307-733-0712 ! Guided Winter Bike Tours in Grand Teton Nat Park ! Spread Creek- A TMBT favorite! Teton Mountain Bike Spring Tours! Connect with Us! More summer bike info here! Grand Teton & Yellowstone National Parks and Bridger-Teton National Forest Permittee. Equal Opportunity Service Company.